Chanteuse US née Maybelle Addington, le 10 mai 1909 à Nickelsville (Virginie). Maybelle Carter, avant d'épouser Ezra Carter en 1926, avait déjà une solide réputation de guitariste. Elle fut en fait une véritable innovatrice, sa technique particulière influençant la majorité des guitaristes Country. 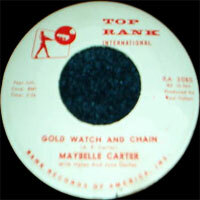 Après la séparation de la Carter Family, elle continua avec ses trois filles (June, Anita, Helen), les "Carter Sisters", Maybelle connut une fin heureuse, assistant en 1970, à l'élection de la Carter Family au Country Music Hall Of Fame. Elle est décédée le 23 octobre 1978 à Nashville (Tennessee). Affectionately and even reverently known as "Mother" Maybelle, Maybelle Carter was one-third of country music's original first family, the Carters. Born Maybelle Addington in May of 1909, she was related by marriage to A.P. and Sara Carter — she married A.P. 's brother Ezra. 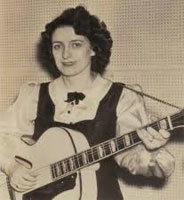 Maybelle Carter was the group's guitarist and also played autoharp and banjo; she created a unique sound for the group with her innovative bass tunings and played on all of their most famous recordings from 1928-1943, some 270 sides. After the Carters split as an act, Maybelle went on the road and into the recording studios with her daughters Helen, Anita, and June, all of whom achieved some degree of success in the country music field; June became a legend. Mother Maybelle enjoyed many milestones in her long career, and was sought out for counsel by two succeeding generations. Most notable was her reunion appearance with Sara at the Newport Folk Festival, which was released as An Historic Reunion, issued on CD first by the Bear Family label in Germany in 1991 and then by Koch International in 1997. Of her solo recordings, her eponymously titled debut issued on the Ambassador label in 1957 drew great acclaim, as did her Queen of the Autoharp album on Kapp in 1964. 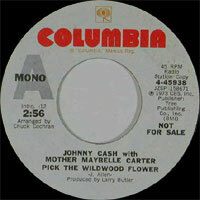 Mother Maybelle was prominently featured as a centerpiece on the 1971 Nitty Gritty Dirt Band classic, Will the Circle Be Unbroken, which introduced her to an entirely new generation of rock fans. She died in October of 1978. 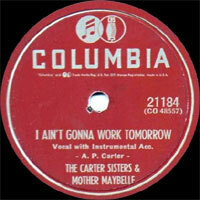 05/1949 78 t. RCA VICTOR 21-057 (US) CARTER SISTERS & Mother MAYBELLE - (This Is) Someone’s Last Day / Why Do You Weep, Dear Willow?